Five APA Group directors have upped their holdings through the dividend reinvestment plan. DUET has finalized the sale of its 29 per cent interest in Duquesne to the Government of Singapore Investment Corporation (GIC). The hedged net sale proceeds of $345 million will be applied to retire DUET's corporate bridge facility. Together with the recent pay down of the outstanding balance on its corporate revolver facility, DUET will have no corporate level debt. Lynas Corporation may upgrade its reserves at its Mt Weld project following receipt of the complete set of assay results for the drilling program on the western side of the Central Lanthanide Deposit and the current open pit at Mount Weld. These show some outstanding intersections, it said, including rare earth oxide (REO) levels up to 20.9 per cent. May are in the 10 to 15 per cent range. The drilling program is aimed at delineating the rare earth oxide (REO) resource to at least an Indicated status, and to enable Lynas to assess whether to include the western side of the Central Lanthanide Deposit into the mine planning process, and thereby upgrade the Reserves of the ore-body. "The tenure of these results gives confidence of a likely increase in the ore reserves towards the end of the year, as well as a modification to the ultimate pit design," said Lynas. Some early assay results for the southern-most holes were announced in the June 2011 Quarterly Report. The complete set of assays covers all 154 holes and 9,604 metres of drilling. New modeling, metallurgical test work and mine planning will be carried out on the area defined by the drilling. Qube Logistics has appointed a new non executive director and announced it will pay a final dividend of 1.9 cents per security. The new director is Ross Burney, the chief executive of Taverners Group, one of Qube's largest shareholders. Mr Burney has 20 years of experience as an accountant and investment manager, having previously worked for BDO Chartered Accountants, Brierley Investments Limited and Guinness Peat Group. He was previously a member of Qube's Investment Advisory Committee and is currently on the board of Customers Limited, Oncard International and recently retired as a director of MSF Sugar. The final dividend takes the total fully franked dividend/ distributions for 2010-11 to 3.8 cents per security, an increase on the prior year of 8.6 per cent. Qube said the increased dividend per security is on a significantly expanded capital base, which has been possible due to the strong financial results achieved in the period. Ceramic Fuel Cells has been awarded the "Innovator of the year" award by Climate Alliance Ltd, an Australian not-for-profit, membership based company that engages with business leaders and communicates the opportunities and risks of climate change. The selection panel said that Ceramic Fuel Cells has demonstrated determined innovation since its inception in 1992. It has invested over $250 million in R&D towards the development of an innovative fuel cell technology that delivers power and heat to households in a very efficient manner. It has developed strong commercial relationships with some of the largest utility companies in Europe." Galaxy Resources has commenced a Definitive Feasibility Study (DFS) on the James Bay Spodumene Project in Quebec, Canada, the completion of which will allow it to increase its stake in the project to 70 per cent. The study and farm-in are part of a 2010 Memorandum of Understanding with Canada's Lithium One Inc. Galaxy acquired an initial 20 per cent equity interest in James Bay for C$3 million and had the potential to earn 70 per cent through funding and completing the DFS within 24 months. The James Bay project is an extensive, surface level, high-grade spodumene pegmatite deposit with the potential to significantly add to Galaxy's resource base and lithium supply. The project will incorporate a mine, processing plant and battery-grade lithium carbonate plant. Galaxy has appointed Montreal engineering services consultancy Genivar Inc. to manage the DFS. Genivar is one of Canada's largest engineering services firms and has extensive experience in the James Bay area, it said. Managing director, Iggy Tan, said Galaxy's lithium project development expertise would enable Galaxy to accelerate the development of the James Bay project. "Galaxy wants to extend its lithium resource base and James Bay's location, geology and the low cost of entry were the key attractive aspects of the farm-in agreement with Lithium One. Galaxy expects to be able to fast track the development of James Bay by using similar capacity and design as the plants constructed at Mt Cattlin and Jiangsu," he said. Mining engineering firm DRA Americas Inc. is working on the James Bay processing plant design component of the DFS. The design of the plant's crushing and heavy media separation concentrator will be modeled on Galaxy's Mt Cattlin plant in Western Australia, with expected capacity to process 1 million tonnes of ore per annum. The James Bay project will also include a battery-grade lithium carbonate plant. The DFS will assess whether the most suitable location is Quebec or in China next to Galaxy's existing Jiangsu Lithium Carbonate facility. Galaxy said the lithium carbonate plant design would mirror the design of the Jiangsu plant, with production of 17,000 tonnes per annum of battery grade lithium carbonate. Similarly, the design will incorporate a purification circuit, allowing production of grades above 99.5 per cent lithium carbonate. This component of the DFS will be undertaken by Hatch Engineering, Galaxy's existing EPCM contractor for the Jiangsu lithium carbonate plant. Infigen Energy's managing director Miles George has expressed his faith in the company with an on market purchase of 150,000 securities for $33,000, an average price of 22 cents. Novarise Renewable Resources hopes to boost its sales in China and internationally with the incorporation of Fujian Sungreen Eco-Friendly Technology Co., Ltd or S-Green. S-Green is the marketing arm of Novarise to develop and market finished recycled PP products. It currently has about 40 products including various bags, slippers, and apparels under its brands that include 'S-Green' and G-World'. Its office is in the port city of Xiamen, Fujian, about 60 kilometres from Quanzhou. It has 30 employees, 10 of whom are involved in product development, and its sales and marketing team is experienced in domestic and international markets. S-Green is looking at expanding sales in Australia and into Southeast Asia this year and is seeking partnering and alliance opportunities. Sales should begin this calendar year, and the sales should improve Novarise's overall profit margins. Novarise said S-Green completes its value chain proposition by marketing finished recycled PP products, raising consumer awareness on recycling of PP finished products, and generating sales and recovery of post-consumer PP feedstock for Novarise. Novarise said that the production facility under Phase 1 of new Nan'an facility is nearing completion and installation of production facilities is due to be completed in October. Initial trial production is also expected to take place in October. The staff accommodation block and administration block will be completed subsequently. Production at the existing Quanzhou facility will continue until the Nan'an production facility is operating smoothly. The relocation move is expected to be staggered over 2012. When completed, the Nan'an facility will be the largest fully integrated yarn-grade PP recycling facility in the world with the annual production capacity of 75,000 tonnes. Novarise will retain the Quanzhou facility and is considering various options including using it as value-adding centre to manufacture finished PP products or as a warehouse for PP feedstock. Completion of environmental monitoring and assessment by RPS Environment and Curtin University of Carnegie Wave Energy's recent in ocean tests of its commercial scale wave energy unit identified no significant environmental issues. Testing included underwater noise monitoring and its impacts on marine fauna, and underwater fauna monitoring using baited and unbaited video cameras. This was analyzed to assess marine fauna present and interactions with the CETO unit. 27 fauna species were recorded. Carnegie said both studies identified no significant environmental impacts from the presence and operation of CETO, and insight into ways of further reducing or eliminating potential environmental impact. It found an array of CETO units has the potential to create an artificial reef habitat that increases biodiversity, said the company. Eco Quest has placed 3,333,333 shares at 3 cents per share to sophisticated investors, raising $100,000 for the production of stock and for working capital. Eden Energy plans to spin out its UK gas assets and raise at least $10 million. The plan is to spinout its UK coal seam methane/ shale gas subsidiary, Eden Energy (UK) Ltd into a new ASX listing called Adamo Energy Ltd. However, this will not happen immediately but when market conditions are suitable. The UK assets are a 2,100 square kilometres landholding in South Wales, Bristol and Kent, and a 50 per cent interest in 17 licences and a 100 per cent interest in three licences. Eden holds 50 per cent of an independently reported shale gas unrisked prospective mean resources GIIP for part of the licence area of 49.8 trillion cubic feet (tcf) or 24.9 tcf. Eden UK has agreed to buy back the 45 per cent interest in the coal seam methane rights in two licences that it sold in 2008 and to acquire a 100 per cent interest in three additional licences in south Wales and complete its remaining farm-in obligations in the original joint ventures. Emerging green energy utility, Enerji has raised 409,000 through a placement to sophisticated and private investors. The capital is to help fund the installation of Australia's first Opcon Powerbox at Horizon Power's Carnarvon Power Station in WA. Greenearth Energy is to raise up to $3.6 million through a non-renounceable 1 for 2 rights issue at 8 cents per share. 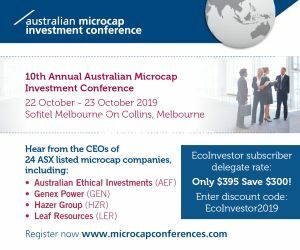 Shareholders will also receive 1 unlisted incentive option for every new share for no additional cost, and exercisable at 5 cents each at any time from 15 April 2012 to 15 October 2012. It will also be used to continue work on the company's domestic geothermal permits including planning and site preparation for the Geelong Geothermal Power Project (GGPP) and an Emerging Renewables application for both the GGPP and the Latrobe Valley Interpretation projects. The offer is not underwritten. Meanwhile, Greenearth Energy subsidiary, Pacific Heat and Power Pty Ltd, has sold two PureCycle Organic Rankine Cycle (ORC) Turbines. The sale was to Service Engineers Ltd, a New Zealand partner that recently won a turnkey contract for capturing waste heat from diesel engines owned by the American Samoa Power Authority. The PureCycle ORC Turbine application will result in an additional 300 kWe net, baseload, zero emissions power for American Samoa. American Samoa, like most of its neighbours in the Pacific Rim, has a high dependency on diesel fuel for its primary power. Greenearth Energy said that despite the relatively small scale of many of the Pacific Island generators, pre-engineered systems reduce the cost of implementing small scale waste heat recovery projects, allowing communities to reduce generation costs and emission levels. The collaboration between PHP, Service Engineers and Pratt & Whitney Power Systems has provided the American Samoa Power Authority with an attractively priced diesel waste-to-clean energy total solution, said Greenearth Energy. Hydrotech International has won a $142,000 tender for waterproofing works at the American Club's Country Club on the south side of Hong Kong Island. Established in 1925, the American Club is a Members Only social club with properties in the heart of the Hong Kong CBD and a clubhouse with full recreational facilities on the island's south side. Lithex Resources has appointed Yankel Koncepolski as a non-executive director. Mr Koncepolski has 31 years of experience in marketing, corporate management and investment management. In the past 11 years, his main focus has been coordinating investment syndicates entering early stage mining exploration and development projects and participating in a range of corporate transactions. Mission NewEnergy has saved itself $10 million through settling all outstanding Series One convertible notes for a cash payment of $5 million. "The Series One convertible notes represented a $15 million liability due in May 2012. Due to the early repayment Mission has settled the debt at a substantial A$10 million discount," said Nathan Mahalingam, the Group' s chief executive officer. Post transaction, Mission has $12.8 million in cash and cash equivalents. Mission has also announced the in-house development of an improved palm oil supply chain process called "Mission g-Palm" that maximizes green house gas savings when producing g-Palm Biodiesel. Mission said it has petitioned the US Environmental Protection Agency for approval to sell the enhanced g-Palm oil based biodiesel in the US. "The use of Mission's g-Palm biodiesel has already been welcomed in major European markets after demonstrating to regulatory authorities that it meets EU sustainability requirements." said the company. Petratherm has again extended the closing date on its share purchase plan, to 14 October. The extension is due to the pending flow test at the Paralana 2 well which is expected to be completed late September or early October. Early findings from the flow test should be released soon after the completion of the operation. Funds from the raising will be used for preparatory work such as to design the well, secure long lead time plant items and to secure a drilling rig slot for the Paralana 3 well at the company's flagship Paralana project in South Australia, and for working capital. The flow test aims to measure the flow deliverability potential of the brine fluids at depth, fluid temperature, and brine fluid chemistry. This is the first time at which extracted geothermal energy (hot fluid) will be brought to the surface at Paralana, an important milestone towards production of geothermal power, said managing director, Terry Kallis. Ocean Power Technologies will collaborate with Lockheed Martin on its proposed commercial-scale wave power generation project at Reedsport, Oregon. Lockheed Martin will provide design, manufacturing, system integration and supply chain management expertise to enhance OPT's PowerBuoy technology. OPT said this builds on previous work conducted by Lockheed Martin and OPT. The collaboration follows a US$2.4 million contract awarded by the US Department of Energy to OPT as part of initiatives announced in September 2010 to promote the development of renewable marine energy. Construction of the Oregon PB150 PowerBuoy's steel structure has been completed, and testing of the advanced power take-off and control system is in process at OPT's production facility in a test environment simulating the varying wave conditions off the Oregon coast. Assembly, systems integration, and land testing of the PowerBuoy is planned to occur over the next several months. It is intended to be the first of a proposed 10-buoy wave power station with a peak generating capacity of 1.5 MW, equivalent to the power needs of about 1,500 homes. "OPT's engineering and innovation efforts for the utility market are focused on improving power conversion efficiency, reliability, manufacturability and lowering the costs of marine operations and maintenance," said Charles F. Dunleavy, chief executive officer of OPT. "We will be rolling out the PB150 PowerBuoy product, our latest utility market offering, over the next few years and will also leverage this experience for the next generation of the PowerBuoy, our 500 kW device that is currently under development.